I put a call into Robert Horry yesterday. Didn’t hear back. It’s cool, Bob. Catch ya next time. New phone? Probably didn’t recognize the number? No worries, my man. With San Antonio next up on the slate, I wanted to ask the former Spur one simple question: Why can’t the Denver Nuggets finish? Heading into last night’s game against the San Antonio Spurs, I predicted that the depleted Nuggets would once again give it their all – just like they’ve been doing lately, both at home and on the road – but come up just a hair short. I theorized that George Karl would once again get the most out of his M*A*S*H unit in basketball jerseys, only to find themselves inadequate in the game’s waning moments. They’d give it the old college try, and then finish like grade-schoolers. Turns out, I was wrong altogether. Opting not to return the query, perhaps Horry knew that my line of questioning was all for naught. Irrelevant. Pointless. Maybe he knew that last-minute heroics could be placed on the bench – just like every Nuggets starter not named Arron Afflalo – and rested for another night. On a chilly Thursday night in Denver, neither team needed a guy like Horry, arguably the greatest clutch player to ever live. Spurs 114, Nuggets 99. And it wasn’t really even that close. “Considering what they had to go through, not just with injuries but the schedule they just had, having to play tonight, it wasn’t a fair fight,” said Spurs coach Gregg Popovich after the game, a contest that was over before it even began. As Popovich suggests, it feels cruel to beat up on the Nuggets, who are, well, beat up. Denver has lost 12 of its last 16. With all due respect to the team’s young players, who appear to have great upside, the nightly lineups in Denver look more like a D-League team. If there’s a silver lining anywhere, it’s that three rookies – Kenneth Faried, Jordan Hamilton and Julyan Stone – each contributed more than 21 minutes. Karl doesn’t like rookies, but he’s getting a crash course in co-existence with them. Hamilton, who played the most minutes with 27, went “0-fer” – 0-for-7 from the field, 0-for-5 from beyond the three-point arch; Karl stuck with him. The Spurs have always had the Nuggets’ number, but Karl and his makeshift team hit more than a mental block last night. They hit a roadblock. A town that was talking about the importance of landing a No. 2 or 3 seed in the Western Conference playoffs just a month ago was reminded that postseason basketball isn’t a given in these parts. If, and only if, the Nuggets can get healthy in time, they’d probably settle for a seven or eight seed. The All-Star break couldn’t come soon enough, as the Nuggets, like no other team in the NBA, could use four days of rest. On the “other side,” Karl should regain the services of Rudy Fernandez and Ty Lawson, but the status of Danilo Gallinari and Nene, who have missed 10 and seven consecutive games, respectively, is still in question. 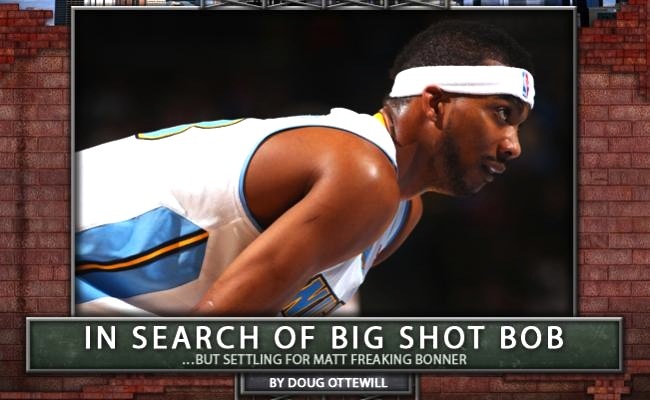 Collectively, however, the Nuggets took one big punch in the gut last night. The question now becomes: Can they somehow avoid being TKO’d? All that talk of whether or not a “superstar-less” team can win in the postseason will have to be postponed if the experiment doesn’t even take place. The Spurs didn’t require their aging stars to beat the Nuggets last night. Tony Parker and Tim Duncan turned in professional efforts (16 and 18 points), but truth be told, all San Antonio needed was DeJuan Blair and Matt Freaking Bonner. For crying out loud, Big Shot Bob! What’s a team (and its city) to do? Are the Nuggets toast? It sure seemed like it last night. Then again, they’ve got Karl on their bench. Over the years, he’s proven he can lead his team to the doorstep of great things. And they’ve knocked, but they’ve also never been let in. Bob, will that ever change? 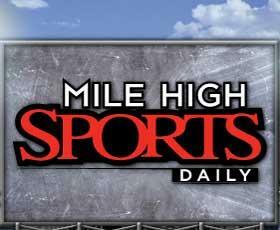 Want more Mile High Sports? Check out Brandon Krisztal’s blog at milehighsports.com. Today, BK provides an inside look at the NFL Combine. Site contents copyright © 2019 Recorder Online	except as noted. All rights reserved. | 87 queries in 2.127 seconds.